Although BrightSource Energy pulled out of the Ashelim tender in the Negev desert, they are relentless elsewhere. Plans to build the world’s largest solar power plant in the Californian section of the Mojave Desert moves one step closer as California Energy Commissioner Jeffrey Bryon recommended in a recent 576-page report that the project be approved, according to mercurynews.com. His report will move on the state’s five panel energy board for a final decision, and the public will be given 30 days to voice their opinions. If all the bureaucratic procedures run according to the plan, then the permits will be in place to start construction later this fall. But not everyone is convinced that the plant’s location is optimal as it will affect areas of the desert that are home to a unique group of native desert tortoises in addition to rare plants such as the Mojave milkweed and desert pincushion. Other experts, however, claim that the region’s high altitude and flat landscape makes the Mojave Desert an ideal location for a solar plant. The plant is the brainchild of BrightSource Energy, a publicly-owned company with operations in the United States, Australia and Israel; the company intends to build three plants with a combined production capability of 392 MW of electricity, and that will cover approximately 3,500 acres of federally-owned land. These plants will provide up to 140,000 homes with power. 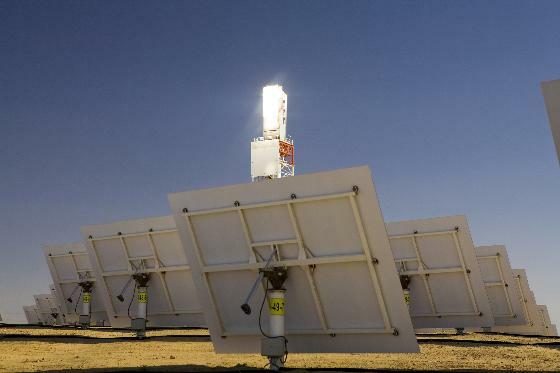 BrightSource operates LPT plants where the heat of the sun is reflected by mirrors known as heliostats to a tower at the center. Running along the tower are water pipes that are heated up to 1000 degrees Fahrenheit or 550 degrees Celsius, generating steam which then powers a turbine. One major difference between BrightSource and other solar power plant operators is that it uses air, rather than water, to cool its power plants, reducing water usage by more than 90%. An additional advantage of BrightSource’s system, according to the company, is that their heliostats are flat, as opposed to parabolic, and therefore smaller, easier and cheaper to install. The position of the mirrors is controlled by a central control system that accounts for a variety of factors such as sun radiation, wind, and air pressure to achieve optimal result. BrightSource has 200 employees and its investors includes venture capital firms Draper Fisher Jurvetson, VantagePoint Venture Partners and Google.org. Next Next post: What is Causing Breast Growth in Chinese Toddlers? I think your first sentence is wrong about Brightsource droping out of Ashelim. I think they just switched french companies from violea to alsthom.